This is the email group of the Newcastle Stop the War Coalition which acts as a list for all the north east events of stop the war groups. 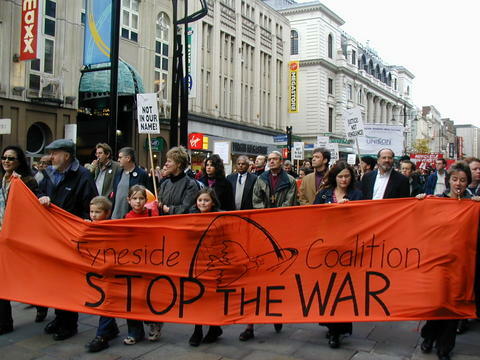 This is a moderated group of Tyneside Stop the War Coalition to notify members of discussions and activities of the Coalition and also advertises events of other stops the war groups. The moderators are elected by the Annual conference. The members meetings which ususally meets the first monday of the month at (Meeting Place is Posted), The moderators decide generally on what to circulate to the group. We also encourage members of the group to submit items for events to the moderators by posting to the list or contacting us, or coming to the meetings and activities.